Everybody loves pictures. Here are some, with more to come! This is a decal meant for the tank of the Allstate Compact scooter. 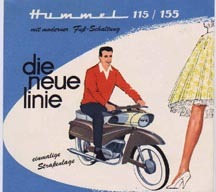 A DS60 Puch in Sears clothing. Here's my buddy Len looking very cool on his brother's Allstate Mo-ped. Circa very early `60's. Little bikes don't get much cooler than this! Euro-styling at its late `50's apogee. Another Silvertone Console. This is an R81 model from 1940.